Invisible Six Ltd is a Glossop-based creative arts production company; publishing books, graphic novels, hosting events, and live projects. 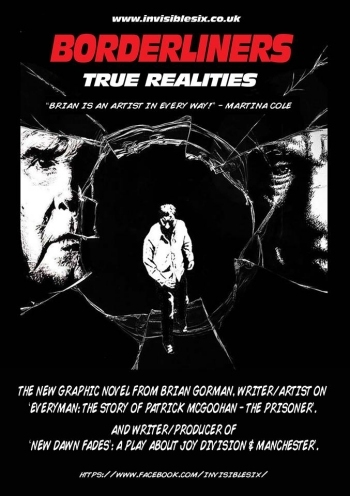 'BORDERLINERS: True Realities' is the company's first graphic novel, written & drawn by Brian Gorman (who also created the highly successful 'EVERYMAN: The Story Of Patrick McGoohan - The Prisoner'). Brian is currently drawing a second book, 'ANIMUS', written by Invisible Six's creative director, S M Worsey, described as 'a story about wild animals rising in consciousness and fighting back against human oppressors'. A crowdfunder campaign is running for the book: Animus: the graphic novel. CLICK HERE TO PURCHASE 'BORDERLINERS - TRUE REALITIES'. A major project for next year is a prestige book covering the production of Brian Gorman's stage play'NEW DAWN FADES: A Play About Joy Division & Manchester', which has played to capacity audiences, and garnered rave reviews, since its debut at The Greater Manchester Fringe Festival in 2013. The book is a collaboration with All Roads Meet Ltd, and designer Giles Bastow, who is also co-producer of the stage play, and the upcoming 2017 tour. Photographer Shay Rowan has covered the show since the very beginning, and the book will feature much of his work. Invisible Six are hosting a 'Crowdfunder Launch' at Manchester's Sandbar on Saturday 29th October, where copies of Borderliners will be on sale, alongside exclusive art prints, and original art from Animus and New Dawn Fades. There will also be an exciting audio-visual presentation featuring original music performed by Tamsin A (from the Manchester band Mr Heart), and a Q & A session with legendary writer Mick Middles (author of many books on Joy Division, New Order, Factory Records, etc.). Festivities kick off from 7pm, and entrance is free.